Replies: 184 (Who? ), Viewed: 38999 times. Sounds great and all, but I'm a little skeptical. How are all these limitations that are present on most, if not all file hosting sites (bandwidth usage, file size limitations, upload as much as you want) suddenly gone? How does that even work? Where is this unlimited bandwidth coming from? Did I miss something in the fine print? I can't be the only one who feels like this. It sounds absolutely amazing, but... how? Huh. It seems interesting, but I agree with you on the whole limitations magically vanishing dealio. *shrug* I have no idea what to think about it. Maybe someone could play around with it and get back to the public with their reports. Seems really lovely, though. Hope it's not a sham of some sort! "God created dinosaurs. God destroyed dinosaurs. God created Man. Man destroyed God. Man created dinosaurs. Dinosaurs eat man...Woman inherits the earth." At the moment it's invite-only and people without anyone to give them the invite have to fill out a form. I filled one out but I have no idea when I'm supposed to get some sort of response back. Maybe @Nysha could chime in? Delphy tweeted that he made the program. 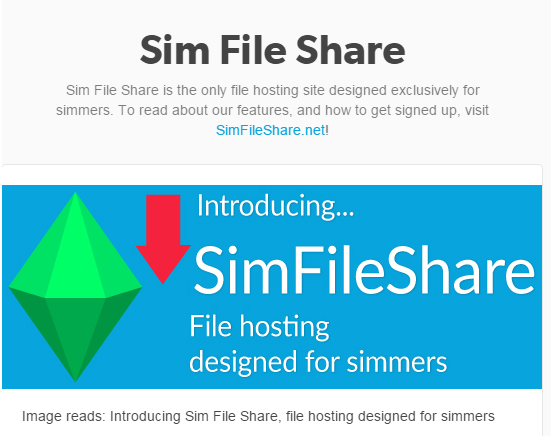 Introducing Sim File Share, file hosting designed for simmers. http://simfileshare.net/ - I made this. Ooh, thanks for the info Gesine. Knowing now that Delphy was the brain behind it, I trust it will be top-notch. I have been messaging Nisha for the past few via tumblr. I signed up but will have to upload later. Seems pretty neat and a much needed asset to the community! @Delphy said that crawler bugs were all over the site last week and was the main cause of the extreme slow down for page refresh. I will not trust going there until the official announcement comes. Yesterday, I downloaded from a creator on tumblr (Riekus13) that used the hosting site for the first time, and all went well (fast and no other issues). Hope things work out in the long run...for everyone. Doesn't seem to be any other info on how to use. I was given a "code", which allowed me to create a "file page", and I managed to put a package.file there; but it doesn't LOOK like it's "Public". That is, if I send a link to someone, they can't get to it. Because they need a "code" - but it looked like getting a code just lets you set up YOUR OWN, PRIVATE, page. I don't see anything to allow seeing other people's pages. None of this makes sense, as I HAVE been sent links that went to someone's file share, where I could download something - no problem. It must be so simple that I can't see it. People have been downloading off my page - post the link @Grammapat and let's see if we can access it. Polgannon: Who Murdered Blaise Penhaligan? Can someone send me a code? @viluxa just remember its only for sim stuff and check your PM. Do I still need to send a code to someone? I have entire BPS website downloaded in a spectacular 5 gb folder. IF anyone can find a way to get me in I'll upload it. Visit My Tumblr for all my Recolors! That link only leads to your own profile. And if someone else clicks it and has an account, it will lead to their own profile. You don't need to send anyone a code for them to download and you can download without being logged in or hacing an account. The codes are for registering an account only. The link you send someone should look like this: http://simfileshare.net/download/7050/ or this: http://simfil.es/7050/. Um K; so I don't know where/how to post the file, somewhere, where it can be downloaded. Anyone who could send me an invite? I use dropbox currently, but some people can't download from it for some reason, so it'd be nice with an alternative for those people. If you have questions on how to use SimPE or WW, you're welcome to PM me. grammapat, click one of the files in your list to view stuff related to that file, and you find the download link at the top of the list. File share sounds brilliant and it's run by Delphy from MTS. I put me trust in him cause he's kept us going all these years. Don't think it's for me, it's for modders, but anything to keep them files out there I will be supporting. There is no "list"; all I've ever put there is this one thing. On the TOP RIGHT of that screen is a "download" button, which is not a link, but starts the Download process.